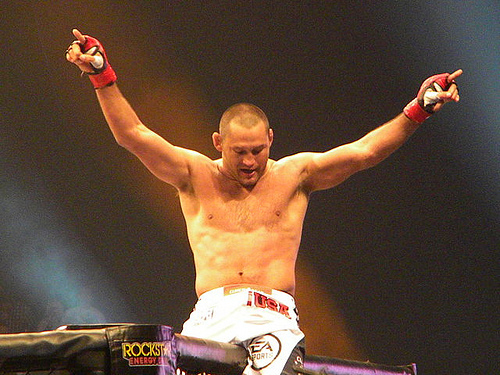 Discussion: Is Dan Henderson the #2 light heavyweight in the world after beating Shogun Rua? At UFC 139 Dan Henderson put on the fight of his life to win his fourth fight in less than a year at 41 years of age. He did so by besting Shogun Rua who many believed was the number two light heavyweight in the world behind Jon Jones. Shogun Rua-It could be argued that the fight with Henderson was so close that Shogun Rua not be moved from the #2 spot. Then again, if you don’t move him…you kind of have to put Dan Henderson there as well since the fight was so close(and he actually won) no? Rashad Evans-Evans has only fought once in the past year, stopping Tito Ortiz in the second round in an impressive performance. His only loss is to Lyoto Machida back in 2009. He did best Rampage Jackson and Thiago Silva via unanimous decision after almost being finished at the end of both of those fights in early 2010 though. Rampage Jackson-Jackson bounced back from the Rashad Evans loss to best Lyoto Machida(narrowly) near the end of 2010, and then Matt Hamill earlier this year before losing to Jon Jones in September. He also has a loss to Shogun Rua many moons ago, but I don’t think you can factor that loss anymore. Jackson bested Dan Henderson four years ago in an epic fight at UFC 75. Again, can you really factor that fight nowadays since it was so long ago? Only Rua was a ranked light heavyweight as Emelianenko was probably a barely ranked top ten heavyweight at the time he knocked him out. We must keep in mind that Henderson moved up to heavyweight to fight Emelianenko (though he actually only gained a few pounds to satisfy that requirement). Cavalcante arguably could have been ranked near the bottom of some top ten light heavyweight lists when Henderson knocked him out and Sobral wasn’t a top ten fighter when Henderson melted him in the first round last December. So we have Henderson fighting some quality fighters in the last year. Rashad Evans being very inactive, but impressive in his lone fight this year while beating some quality competition in early 2010. Rampage Jackson earned two quality wins within the last year and took Jon Jones farther than any fighter thus far. Shogun Rua defeated Lyoto Machida last year and then was melted by Jon Jones earlier this year. He then avenged a previous defeat against Forrest Griffin before the epic war with Henderson. So looking at the above information would you consider Dan Henderson the number two light heavyweight in the world? If not, where would you place him?